"It’s the best Rendu they have ever made." The opticalRendu utilizes an SFP fiber optic transceiver at its input to provide 100% galvanic isolation from the network and USB-audio output. The opticalRendu has linear power regulation, CPU circuit design with femto clocking, USB circuit design with femto clocking, and a network circuit design with femto clocking. This unit utilizes SonicOrbiter for its operating system so you already know how to use it. So there’s more info trickling out. It appears the Sonore opticalModule is basically Sonore’s attempt at an FMC (ultra low noise everything, everywhere in the circuitry). 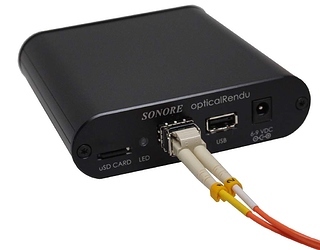 But it’s the Sonore opticalRendu that’s more interesting to me with it’s fiber input (not as interesting as a fiber input DAC but the next best thing I guess). Lets see how much they will cost, I have a feeling that opticalRendu will be on the wrong side of $1000, but hopefully the opticalModule wont be to expensive. But the new stuff from Sonore will make the new switch from UpTone redundant, wont it? Not useful to combine them. Probably but it’s a single box, needing only a single PSU and there will apparently be improvements on the already great ultraRendu. For a USB source, it will likely be as good as it gets (in terms of signal integrity), knowing John Swenson’s work. but hopefully the opticalModule wont be to expensive. I doubt it will be as affordable as even my SoTM modded FMC’s but I don’t doubt if it will be technically much better. It will be better (on paper) than what I have but whether audibly better, who knows. Depends on how many ethernet devices you have in your system/setup where you want a low noise ethernet connection… the FMC (opticalModule) will only have a single RJ45 ethernet port. The Uptone switch has more ethernet ports, so it can serve a different function, depending on what the user needs for their system. So it’s not exactly apples to apples comparison. Probably best to daisy chain it with a host of other peripherals just to be safe. Nope, I’m not sceptical at all. No Steve…that is not how we operate. The data has always been perfect or you would get dropouts and non bit perfect playback. This is about noise / galvanic isolation. Yes, you need a power supply, but we have always sold our units with and without a power supply and even with an inexpensive power supply. The customer always decides. Also, even on our Signature Rendu we have always recommended high quality and affordable ethernet cables from Blue Jean Cables and this will continue to be the recommendation here. We don’t sell plus models, but new models with multiple new features are part of evolution. Finally, we don’t recommend complex just to be safe solutions. You need a opticalModule to convert between optical and cable Ethernet. With this one opticalModule you can connect an original micro/ultraRendu or the new opticalRendu. Really…no need for skepticism. So, if I have an ultraRendu already, and that’s it, which one of your new Sonore products do I need to buy to get full optical isolation to my ultraRendu? Actually I am interested, that’s why I’m reading this topic. But that was one of the things the micro/ultra rendu claimed to obliterate? Using LX SFP modules is it safety to use them with short fibercables if they have -3dBm max output and max -3dBm on the input? Dont want to have problems with overloading the input and have the LX modules laying around. We don’t make those kinds of exaggerations. However, they did and still do reduce noise and have galvanic isolation within their design limitations. However, the opticalRendu has infinite galvanic isolation from the network via fiber optic and an improved power regulation scheme on board. Standard Ethernet also has galvanic isolation due to being transformer-coupled - no? Yes, a fair amount of inherent galvanic isolation but variable amounts based on the design of the circuit and specification of the parts. John the designer of the boards was able to easily detect high empedance noise from routers and switches that sail right into downstream gear. That noise is stuck at the port with fiber optics. One thing I am curious about: since the output from opticalRendu (and other ethernet transports) is asynchronous USB (which means the DAC handles the clocking and asks for data when needed), why is the clock in the transport important? Unless I am mistaken (which I probably am), the DAC will use its own clock and hence that clock will be responsible for any jitter. Or can jitter be created before being sent over USB, but if so whats is then the purpose of asynchronous USB? The asynchronous DACs will use their own local oscillator from their USB interfaces. Most of the ones I have seen are standard quality oscillators though:( Anyway, the oscilators we use are very high quality and meant for our local circuits which need them. On the opticalRendu we have two femto oscillators which are utilized by the CPU, USB, and network sub systems. Cheers for the explanation. I assume the high quality clocks are to minimize jitter on USB output. But now to a tricky question: if I use the opticalModule and connect with fiber to opticalRendu (and then to a USB DAC), will anything before the opticalModule influence the sound provided the data is delivered correctly? Things like linear power to ethernet switch (or the switch itself), Roon server or computer and so on? As far as I can see, nothing before the fiber will matter since fiber is one of those rare cases where “bits are bits” (no audio-jitter, no electronic noise). Or am I simplifying to much?